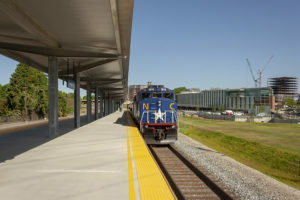 The first trains departed Raleigh’s new Union Station for Charlotte early Tuesday morning, marking the end of years of planning and construction that went into the project. Clancy & Theys and Skanska, in association with Holt Brothers Construction, completed the state-of-the-art project in April. Union Station will now serve as a multi-modal transportation hub and will help meet the needs of the area’s rapidly growing population. The station’s modern and industrial features are reminiscent of the old Dillon Supply warehouse that once stood on the same lot. A 920-foot platform, a circular drive for picking up and dropping off passengers, cost-effective parking are all features of the new transportation hub. Union Station will make it easier for people to travel and commute to and from other communities in our region. Four daily round trips from Raleigh to Charlotte are now available at Union Station, offering stops in Cary, Durham, Burlington, Greensboro, High Point, Salisbury and Kannapolis. Amtrak’s New York to Florida Silver Star line will also serve the new station. Clancy & Theys is excited for the new opportunities Union Station will bring to downtown Raleigh and looks forward to continuing to help meet the growing needs of the region. Read more about the opening of Union Station from the Triangle Business Journal here.